Boxed Red Marketing is thrilled to announce a prestigious award win. 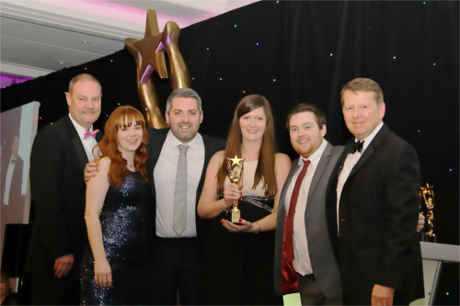 The team has been named ‘Customer Service Team of the Year’ at the 2014 British Excellence in Sales and Marketing Awards (BESMA), hosted by the Institute of Sales and Marketing (ISMM). The BESMA judges praised Boxed Red’s enthusiasm and commitment to putting the customer at the heart of everything they do. The fact that the company’s growth is built on referrals and the team constantly strives to improve by taking customer feedback into account was part of the reason why Boxed Red’s entry was commended. Host of BBC Breakfast, Bill Turnbull, presented Boxed Red with the prestigious award, congratulating the team on being selected by the ISMM, the worldwide representative body for sales and marketing personnel. The Boxed Red team scooped the prize over global names such as Lyreco and AXA Insurance, as well as huge UK firms including British Gas and E.ON. Boxed Red Marketing was shortlisted from a written entry, and was chosen as the overall winner after a presentation day attended by the owners of the company, Janna Caley and Craig Fell. The BESMAs represent the UK’s highest level of recognition for outstanding achievement in sales and marketing and identifies organisations in which ‘best practice’ is clearly demonstrated.